Kyle Guy and No. 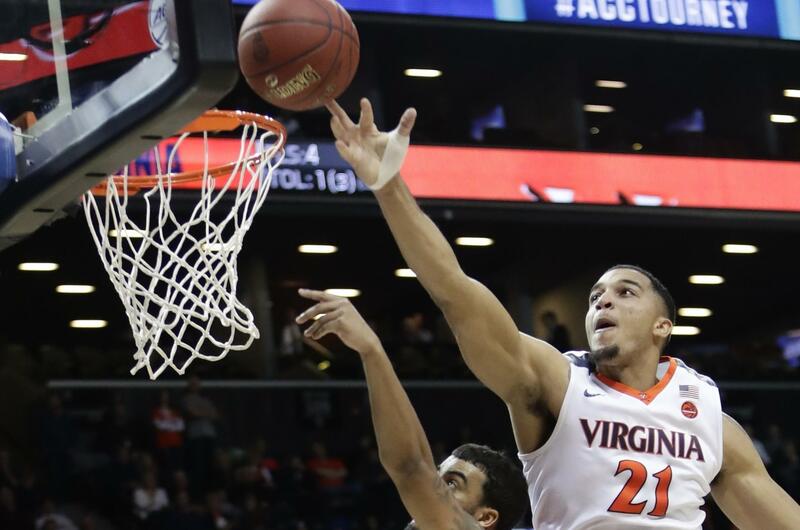 1 Virginia looked like healthy favorites in their postseason debut, beating Louisville 75-58 on Thursday in the quarterfinals of the Atlantic Coast Conference Tournament. Guy scored 19 points in his speedy return from a sprained left knee and the top-seeded Cavaliers (29-2) weathered a second-half charge. They’ll play 19th-ranked and fourth-seeded Clemson in the first semifinal Friday night in Brooklyn. The ninth-seeded Cardinals (20-13) will sweat out Selection Sunday hoping for an at-large bid. (2) Villanova 94, Marquette 70: Mikal Bridges hit four 3s and scored 25 points and Big East player of the year Jalen Brunson scored 21 as the Wildcats (28-4) made 15 of 29 3s in the quarterfinal victory in New York. Jay Wright became the winningest coach in Villanova history with 414. Markus Howard scored 23 points and Andrew Rowsey had 22 for Marquette (19-13). (3) Xavier 88, St. John’s 60: Trevon Bluiett scored 27 points, Kaiser Gates had 16 and Xavier looked every bit the top seed in the Big East Tournament in New York. The teams scuffled on the postgame handshake line and had to be separated as the crowd stood for the unexpected fracas. The Musketeers (28-4) dominated in the second half on the Red Storm’s home court at Madison Square Garden. Xavier plays Providence in a semifinal Friday. Marvin Clark II led St. John’s (16-17) with 18 points. (5) Duke 88, Notre Dame 70: Marvin Bagley III had 33 points and 17 rebounds and Grayson Allen made his first five 3-pointers as Duke rolled in the Atlantic Coast Conference Tournament quarterfinals in New York. Allen finished with 23 points and the second-seeded Blue Devils (26-6) advanced to play sixth-seeded North Carolina in the second semifinal. Bonzie Colson had 18 points and nine rebounds for the 10th-seeded Fighting Irish (20-14). (9) Kansas 82, Oklahoma State 68: Malik Newman scored a career-high 30 points, Svi Mykhailiuk added 13 and Kansas reached the Big 12 semifinals in Kansas City, Missouri. Devonte Graham added 10 points, four rebounds and nine assists for the top-seeded Jayhawks (25-7), who were swept by the Cowboys (19-14) in the regular season but broke through when it mattered. They advanced to play Kansas State. Jeffrey Carroll scored 17 points and Kendall Smith had 14 for the No. 8 seed Cowboys. (12) North Carolina 82, (24) Miami 65: Theo Pinson scored a career-high 25 points and had 11 rebounds, lifting North Carolina to a second straight Atlantic Coast Conference semifinal meeting with Duke. The fifth-seeded Tar Heels (24-9) face the fifth-ranked and second-seeded Blue Devils for the third time this season for a spot in the championship game – just as the rivals did last year. It will be the 22nd time Duke and North Carolina play in the ACC Tournament. Duke leads 13-8. (14) Texas Tech 73, Texas 69: Keenan Evans scored 25 points, including a fadeaway jumper in the closing minutes, and Texas Tech held off hot-shooting Jacob Young and Texas in the Big 12 Tournament quarterfinals in Kansas City, Missouri. Jarrett Culver added 13 points for the Red Raiders (24-8), who had lost four of their last five in the regular season. Young had a career-high 29 points for the Longhorns (19-14), going 11 of 17 from the field and 6 of 7 from beyond the arc. (15) Arizona 83, Colorado 67: Allonzo Trier scored 22 points, Dusan Ristic had 15 points and 11 rebounds, and Arizona used a big second-half run to roll in the Pac-12 quarterfinals in Las Vegas. Arizona (25-7) wasn’t exactly crisp on offense and Pac-12 player of the year Deandre Ayton had a rare quiet day. The Wildcats made up for it with scrappiness, earning a spot in the semifinals. Ayton missed numerous shots he typically makes, fouling out after scoring 10 points on 4-of-14 shooting and grabbing six rebounds. George King had 19 points for Colorado (17-15). (18) West Virginia 78, Baylor 65: Esa Ahmad had 21 points and Daxter Miles Jr. added 19 as West Virginia advanced to the semifinals of the Big 12 Tournament in Kansas City, Missouri. Jevon Carter also had 18 points and 11 assists for the third-seeded Mountaineers (23-9), who swept the Bears (18-14) during the regular season and have won six of the last seven in the series. West Virginia will play No. 14 Texas Tech, the tournament’s second seed, on Friday night for a spot in the championship game. The Mountaineers have been to the last two finals, but still have not won a conference tournament since capturing the Big East crown in 2010. Manu Lecomte led the No. 6 seed Bears with 27 points. (19) Clemson 90, Boston College 82: Gabe DeVoe scored 25 points and Shelton Mitchell had 21 as Clemson advanced to the Atlantic Coast Conference Tournament semifinals for the first time since 2011. The fourth-seeded Tigers (23-8) will face top-seeded and No. 1-ranked Virginia. The Eagles’ backcourt of Jerome Robinson (20 points) and Ky Bowman (23 points) combined to shoot 10 for 32 from the field, a day after the pair scored 50 points to carry BC (19-15) to an upset of North Carolina State. (22) Nevada 79, UNLV 74: Jordan Caroline had 21 points and 10 rebounds to lead Nevada in a quarterfinal matchup between in-state rivals in the Mountain West Conference Tournament in Las Vegas. Top-seeded Nevada (27-6) used a 22-6 run early in the second half to erase a 12-point deficit and seize momentum after a dismal offensive performance in the first half. Kris Clyburn led No. 8 seed UNLV (20-13) with 19 points and six rebounds. Published: March 8, 2018, 9:41 p.m.